The Los Angeles County Coroner's office said it is investigating two deaths possibly related to the Woolsey Fire that's been burning a destructive path across two counties since Thursday. The 70,000-acre fire has consumed untold numbers of homes and forced evacuations as it cut a path from Simi Valley to the sea. At a Saturday news conference, Los Angeles County Fire Chief Daryl Osby said the bodies were found in the 33000 block of Mulholland Highway. "Sadly and tragically, I'm reporting today that we have two fatalities that occured in the fire area," Osby said. "That is currently under investigation. We have our homicide investigators on scene, and we'll treat that as a fatality at this point, and we'll have more to talk about that later on as the investigation unfolds." A cause of death was not immediately available. Osby did not say whether the deaths were fire-related. The Woolsey Fire erupted Thursday afternoon in Ventura County. It raced into Los Angeles County, chewed its way through brush and into neighborhoods of Westlake Village and Malibu. As of Saturday morning, containment of the 70,000-acre fire was at 0 percent. An estimated 75,000 homes -- although likely many more -- were under evacuation orders in Ventura and Los Angeles counties. The entire city of Malibu was placed under an evacuation order late Friday morning, with residents directed to southbound Pacific Coast Highway, creating miles of stand-still traffic along the scenic route. 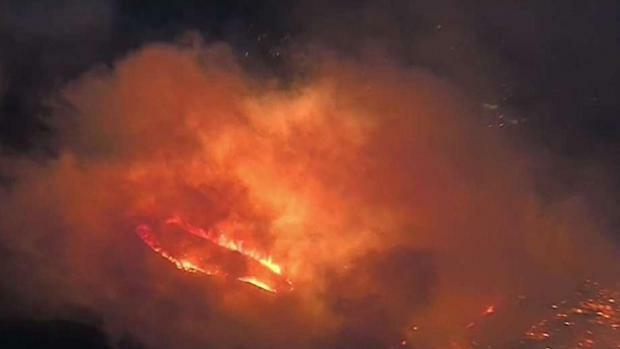 Evacuations had been expanded in Simi Valley. Acting Gov. Gavin Newsom declared a state of emergency Friday due to the destructive Woolsey Fire and nearby Hill Fire. A state of emergency was declared Thursday for the monster Camp Fire in Northern California. "The wind-whipped conditions ... this is ripe conditions for explosive fire behavior," said LAFD Capt. Erik Scott. "This is the new normal. When we have conditions like this, when it's such incredible wind, that brings us in to a different caliber, so it's become a much more challenging condition." A Los Angeles County Fire Department battalion chief told NBC4 the flames could burn "for days." Dominic Oliveri fled from his home in the Decker Canyon area with his wife. They were stopped along Mulholland Highway near Little Sycamore Canyon Road. "We waited as long as we could and the flames were coming down the hill opposite of us, and we just aid we had to go," he said. "I've been here 40 years, and I've seen it all. This is the first time I had to leave my house ever." Power outages were reported in parts of Calabasas. The fires burned in a community that was already reeling from a mass shooting that left 12 victims dead Wednesday night at a Thousand Oaks bar. The fast-moving Woolsey fire grew overnight as it spread from the Simi Valley area into Agoura Hills, jumping Highway 101. Meghan Reyes reported for Today in LA on Friday Nov. 9, 2018. The Thousand Oaks Teen Center was a family unification center Thursday, a place where families anxiously waited for updates on loved ones who were at the Borderline Bar. On Friday, the center was an evacuation center for people fleeing the fire. "I think a lot of people should realize this is what your valuable life leads to," said a man from Ventura County as he pointed at his truck. "Plastic bags on the back of your pick-up truck." Along with assisting the growth of the fire, the high winds also deterred air support in battling the flames. The Woolsey Fire was first reported around 3:30 p.m. and by 4:45 p.m. It started east of Chatsworth near a former Rocketdyne facility. The Hill Fire burned just five miles away in Newbury Park, forcing more than 1,200 homes to evacuate and prompting the closure of the 101 Freeway. For coverage of that fire, click here. Through Nov. 4, Cal Fire has reported about 5,600 fires that burned more than 621,700 acres. During that same period last year, the agency reported 5,800 fire that burned 316,600 acres. Over the last five years, California has averaged 5,293 fires that burned 231,400 acres during that interval. NBC4's Jonathan Lloyd and Heather Navarro contributed to this report.